I'm finally back after quite a break! We spent a week in LA and another week in NYC and I must say it was amazing to be back in that bustling city I love so much.. I will write about my US foodie adventures in the next post, but for now I will share my delish Chicken Tajine recipe as promised over the weekend.. I've been to Marrakesh a few times.. It's a beautiful city with loads of yummy food.. I remember spending fun times with dear friends eating gorgeous pastries while sitting in the courtyard of lovely Riads (large villas converted into boutique hotels).. 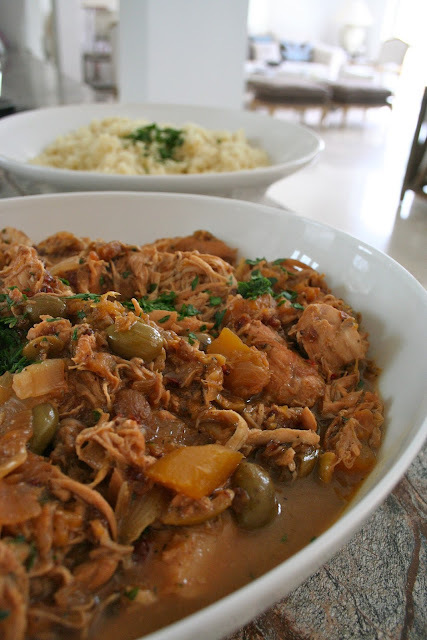 So watching Jamie make a Beef and a Chicken Tajine the other day, made me want to get into my kitchen and do my own version of this Moroccan comfort food.. In a large pot (cast iron or tajine pot if available but not necessary), heat a little olive oli and sear the chicken breasts until golden brown on each side. Remove from the pan and set aside. Add a little more oil and cook the onions and garlic for a few minutes, deglazing the pan. Return the chicken back to the pot and add all the ingredients apart from the parsley. Bring everything to a boil, then cover and simmer for about an hour or until the chicken is tender and I like it even a little shredded. When ready, add the parsley and let the Tajine stand for about 10 minutes. Make the couscous by following the instructions on the pack, and sprinkle with a little parsley and serve with the Chicken Tajine. Enjoy! Looks and sounds delicious, thanks for the recipe!